As you can imagine, exercise becomes increasingly important as we age, yet more and more aging adults are not getting the proper amount of exercise they should be getting on a daily basis. Use this helpful guide to encourage your loved one to get inspired and get moving! 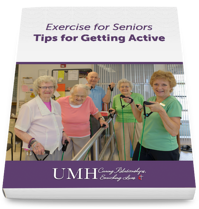 Learn how you can keep your senior moving to increase mental health, body awareness, and sociability. To download this FREE guide on the importance of maintaining physical health, please fill out the form.